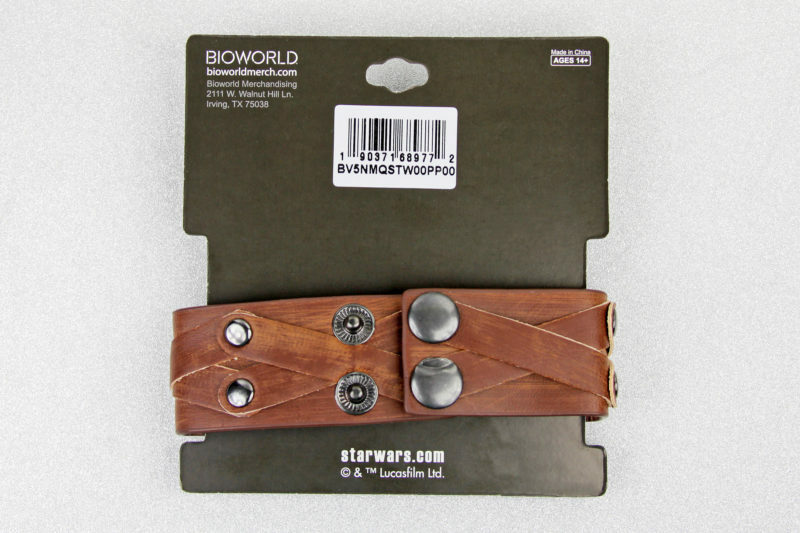 Today’s review features the Star Wars Rebel Symbol bracelet made by Bioworld. 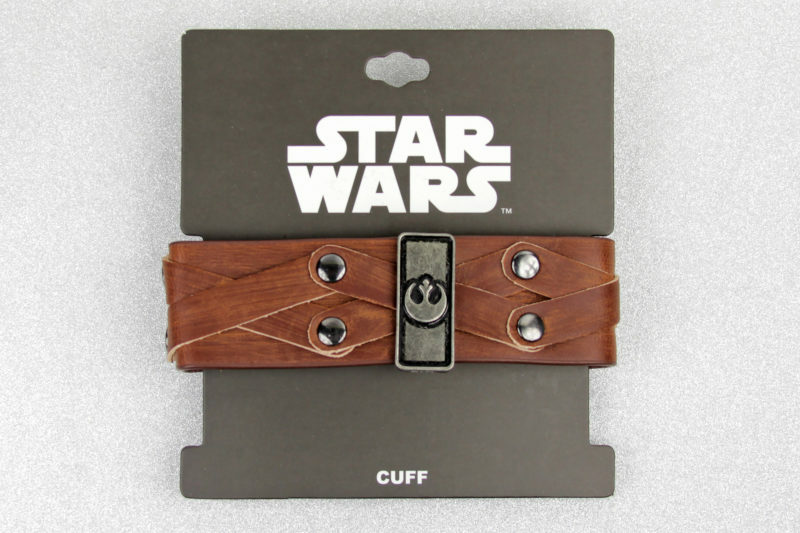 The faux leather bracelet features a wrist cuff design, which is reminiscent of the leather cuff Rey wears with all her costumes. 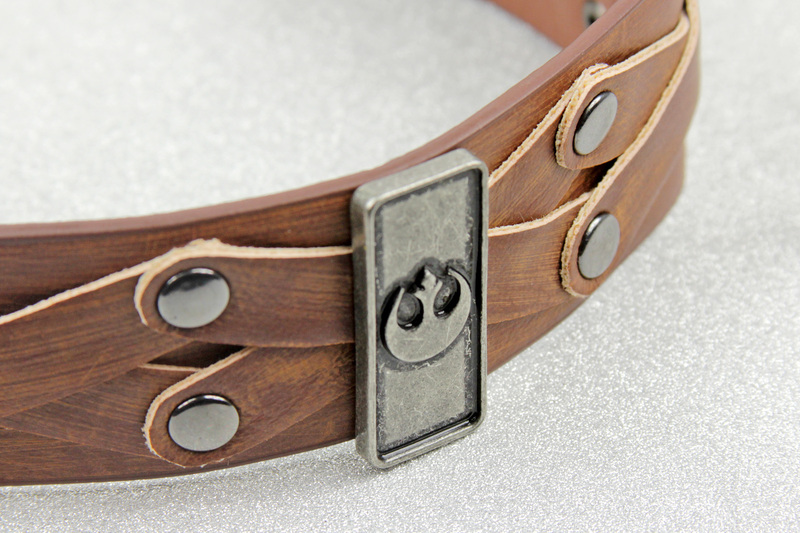 I am always on the lookout for Rebel themed accessories for my collection – the brown faux leather works well with jedi themed outfits too! Continue the epic journey as it unfolds in Star Wars: The Last Jedi! This Star Wars: The Last Jedi Rebel Symbol PU Bracelet features the Rebel symbol amidst a woven pattern. Add a dash of Star Wars: Episode VIII – The Last Jedi to your wardrobe! The bracelet is available from a number of Amazon sellers – prices/shipping polices vary by seller (international customers can order via a mail forwarding service). The bracelet came packaged on a black cardboard backing card, with the bracelet wrapped around the card. The front of the card is printed with the Star Wars logo, while the back of the card features the Bioworld company information, item barcode, and the Lucasfilm copyright information. This packaging style keeps the bracelet stored flat, so when removed from the backing card, the bracelet tended to stay flat. I corrected this by fitting the bracelet snuggly around a drinking glass for a few days, which helped form a rounder shape (as seen in my review photos). 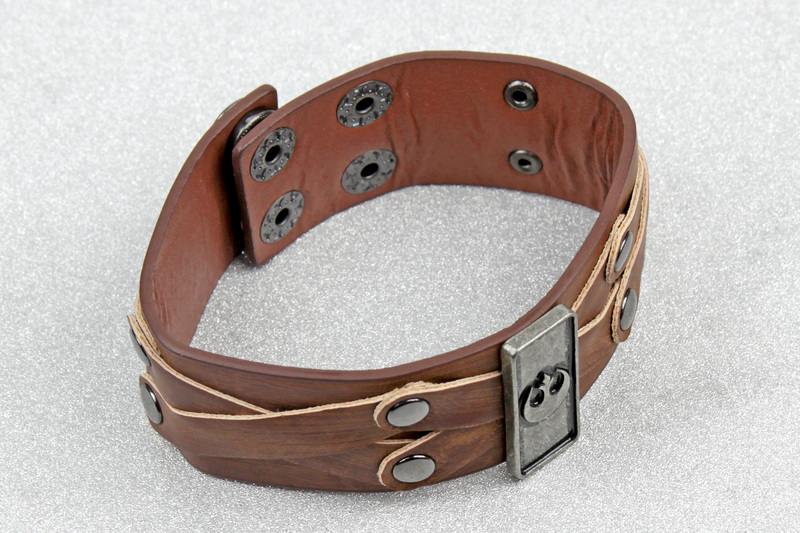 The Rebel Symbol bracelet is made from brown faux leather, with a main wide band decorated with strips and a central symbol plaque. The faux leather has a brushed surface, with a two-tone brown colour. This brushed effect works well with the weathered style of the metal symbol plaque, and helps give the faux leather a more realistic leather appearance. When measured flat, the bracelet measures approximately 23.8cm end to end, and 3.1cm across. This is a nice width for a cuff style bracelet – it is not too big or bulky for everyday wear, but large enough to still have that classic cuff shape. The front of the bracelet features a metal rectangular shaped plaque, which is riveted onto the bracelet. The plaque has a recessed front surface, with a raised Rebel ‘starbird’ symbol in the center. The metal has a weathered finish, accented with black antiquing. The plaque measures approximately 32mm by 13mm. 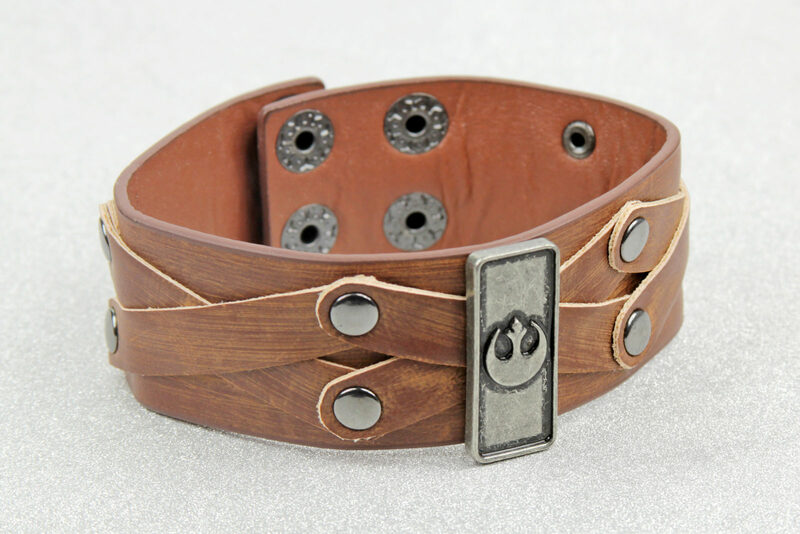 I like the ‘weathered’ style for Star Wars rebel themed accessories like this bracelet – both the Rebel Alliance and Resistance tend to have a ‘worn and used’ aesthetic to their outfits and equipment, in contrast to the ‘shiny and new’ appearance of Imperial and First Order forces. The bracelet has an additional layer of overlapping strips, which are arranged in a ‘criss-cross’ pattern along the band. The strips are held in place with small gunmetal-colour metal studs at each end (total of 8 along the bracelet). 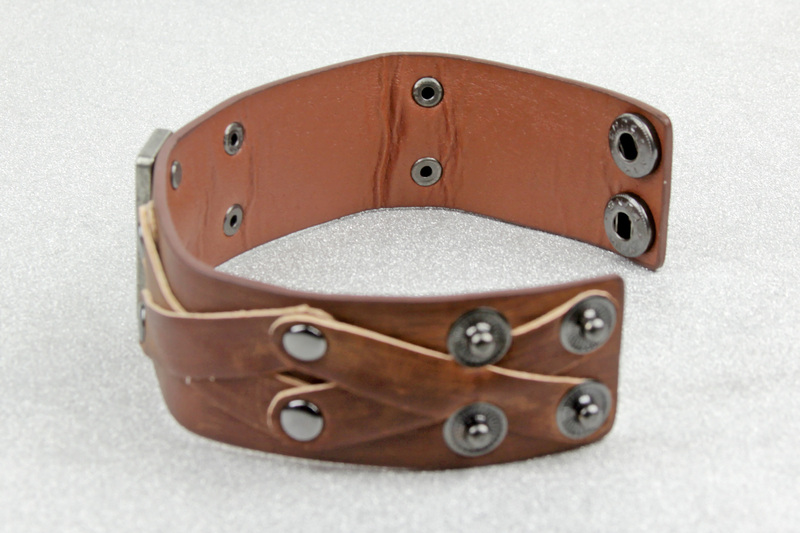 These studs are riveted on, with the backings visible on the inside of the bracelet band. 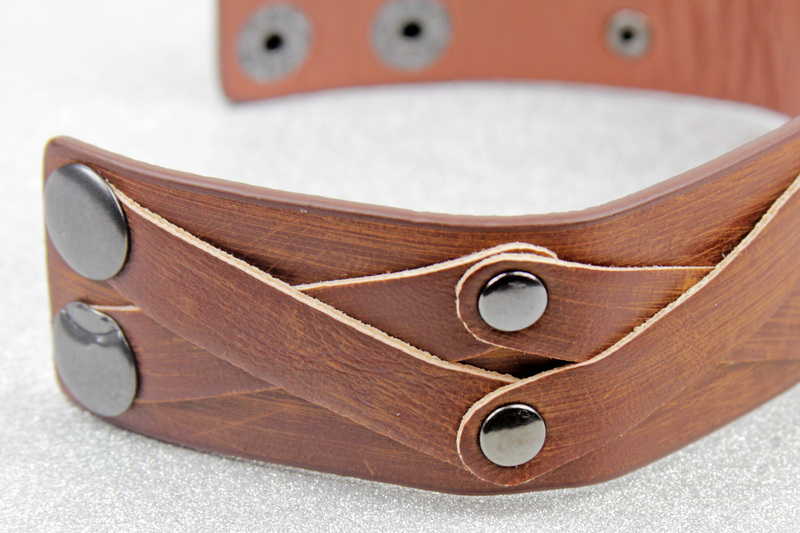 The edges of these strips are left raw – that is, not painted dark brown like the edges of the main bracelet band. The bracelet closes with gunmetal-coloured metal dome studs – these are larger than the domes used to secure the top strips. There are two ‘top’ domes on one end, and other end features four ‘bottom’ dome settings. 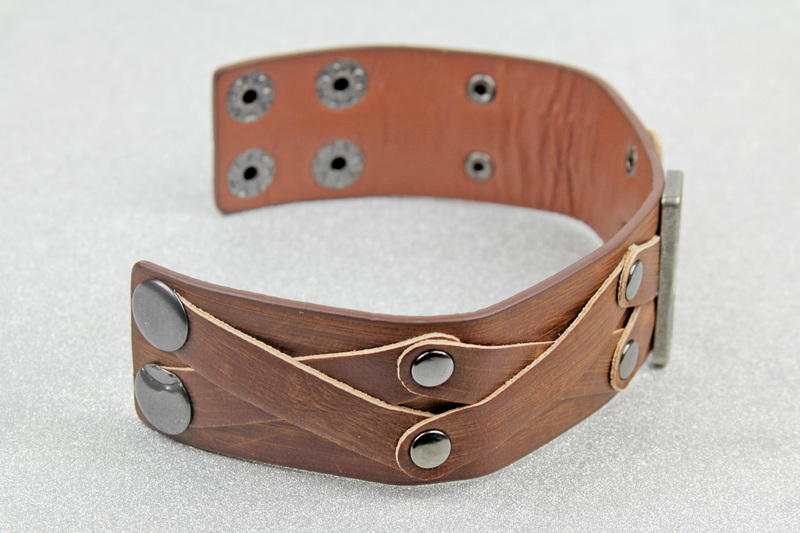 This bracelet is adjustable, with two sizes, depending which set of dome settings you use. 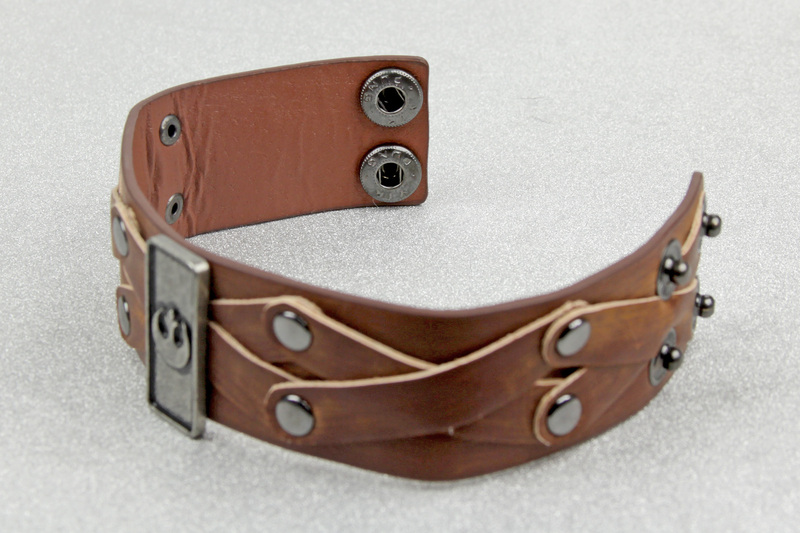 When closed, the bracelet can be adjusted to two sizes – with approximately 20.5cm and 18.5cm internal circumferences. At the smaller size setting, it sits comfortable at my wrist, not tightly (I can slide it up my arm a little). This particular bracelet has a very slight flaw – one of the top dome closures has an indent, probably caused while setting the other top dome stud. It is a little bit of a shame, but this is on the underside of the bracelet, and does not affect the dome closure function itself. 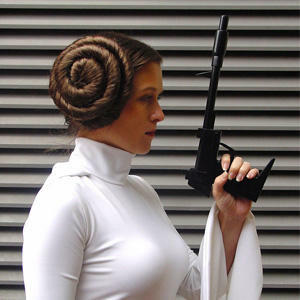 As I review most of my Star Wars fashion items, I always hope I don’t receive items with flaws, but it does happen – such is the probability with mass production (and receiving items in the mail where I can’t inspect them first). Overall, I like this bracelet more than I thought I would. 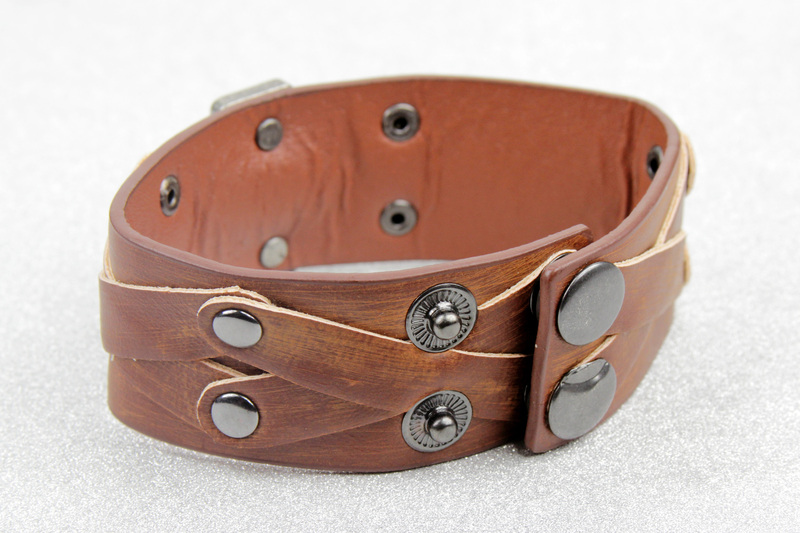 The faux leather is softer and has a real leather look (especially compared to other versions like this faux leather Rey bracelet). 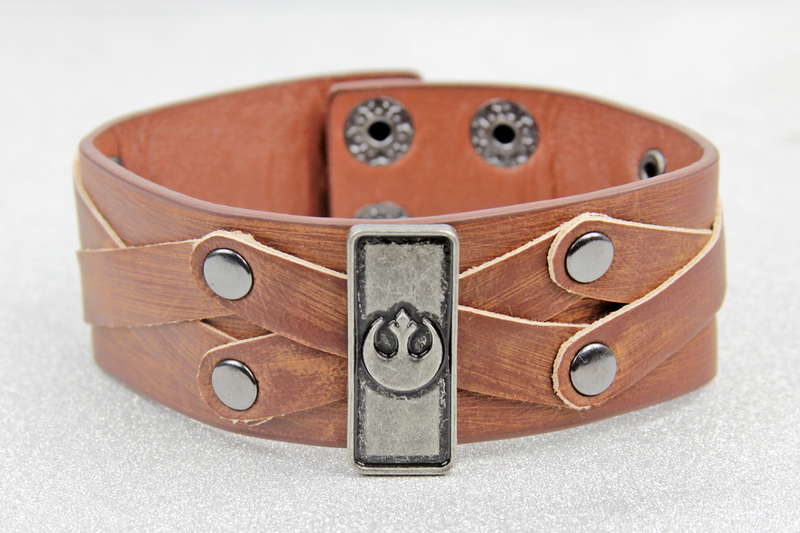 It works well with a Rey themed outfit – this cuff is a little more subtle than a full leather wrist cuff like Rey wears, but still evokes her style. It is comfortable to wear, and coordinates really well with any Rebel themed outfit.